Earn 4.2 SB per $ when you buy Steak 'n Shake gift cards at MyGiftCardsPlus, powered by Swagbucks. The perfect gift is easy and convenient to give. Your friends, family and co-workers will be delighted to receive the gift of Real-Steak Steakburgers, Real-Milk Milk Shakes, and everything else on our full menu. Our gift cards can be used at any Steak 'n Shake®, anytime. 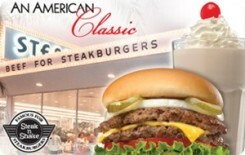 For balance information, check your receipt; visit steaknshake.com; or call 1-888-892-3813. The TAKHOMACARD® must be activated through a completed transaction - please keep your receipt. You can reload your TAKHOMACARD® at any Steak 'n Shake® restaurant or at steaknshake.com. The TAKHOMACARD® cannot be redeemed for cash and is only valid at Steak ?n Shake® restaurants. Steak 'n Shake® is not responsible for lost, stolen, damaged or unauthorized use of cards. The TAKHOMACARD® has no expiration date, but after 24 months of card inactivity, a $1.50 per month service fee will be deducted from the card's balance until depleted, except where prohibited or restricted by law. Inactivity fees are charged based on the state in which this card was purchased. Use of this card constitutes acceptance of these conditions. The TAKHOMACARD® can be used at any Steak 'n Shake® restaurant.